A review in 10 words (or thereabouts): "Why do you wear a mask? Were you burned by acid or something?" "Oh no. It's just they're terribly comfortable. I think everyone will be wearing them in the future." And that's the closest I got to The Princess Bride. 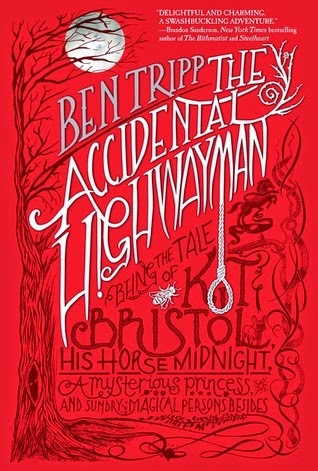 In eighteenth-century England, young Christopher "Kit" Bristol is the unwitting servant of notorious highwayman Whistling Jack. One dark night, Kit finds his master bleeding from a mortal wound, dons the man's riding clock to seek help, and changes the course of his life forever. Mistaken for Whistling Jack and on the run from redcoats, Kit is catapulted into a world of magic and wonders he thought the stuff of fairy ales. When a book is compared to Stardust and The Princess Bride, it's kind've just begging to be read. So that's what I was expecting, or wanted badly for what it's worth, when I started the book several weeks ago. Yes. Several weeks ago. For some unknown reason, it took me FOREVER to read this book. We'll get back to that in a moment. Kit is a servant who unwittingly finds himself on quite the adventure. There is a princess (who is also a fairy), a witch (who is a bit of a crone), a horse (who is on par with Maximus from Tangled), and pixies, and gryphons, and a senile old man, and a crazy Captain who wants misguided revenge. It's complicated. But it's fun. Which begs the question, why in the world did it take me the better part of a month to finish it? Was it the disappointment that the books was not, in fact, on the level of The Princess Bride? That the pure joy I feel every time I read the classic and the laughter that ensues from the timeless humor was missing?Or was it just that I am an easily distracted reader? (Which is totally true...) I think it was a bit of both. Kit is a really likable character. He's thoughtful, brave, cunning, and daring. Morgana is a little less flushed out, which is understandable since the entirety of the story is told by Kit himself. Unfortunately the same can be said about the evil-doers who often seem too far away to do any harm. I liked Kit, but I didn't have any strong feelings toward anyone else. Except the horse. The horse was awesome. On the adventure side of things, the good is good and the in-between is a little boring. Things luckily pick up the last third of the book and the world that Tripp created was pretty exciting. But will most stick around that long? So three gnomes. Because what I liked I really liked. Minus two stars because it didn't quite live up to expectations. Should you read it? Absolutely. Will I recommend it to others? Hold out your hand. Will it be the best story you've ever read? I'll leave that decision up to you.